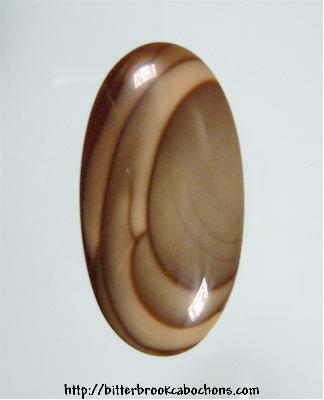 Here's a well-defined Bruneau Jasper oval. Picture looking down into a brown & tan lava lamp... Now THERE'S a picture! 39mm x 20.5mm x 6.5mm. Weight: 41.75 carats. Do you like Bruneau Jasper Cabochons? Click here to see all of the Bruneau Jasper Cabochons on the site! You are visitor number 37 to this page this year.